Join us for Random doubles on Wednesday nights and Sundays! If you don't already have a tag, get in touch with Rob Feeney to purchase one for $10 (5 for tag/5 for course). 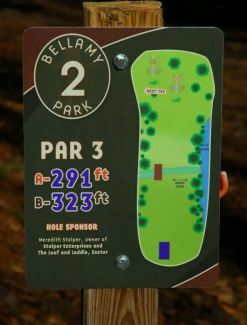 Description: A network of shorter fairways carve their way over the varying terrain created by the brooks and streams that feed into the Bellamy River. Relatively technical and tight at times, the layout progressively gets more difficult and distances range from just under 200' to just under 500'. Dual tees and multiple pin positions. Local Directions: I-95 in Portsmouth; take Rte. 16 to exit 8w in Dover. Take a left on Bellamy Rd. Parking is 0.25 mile on right, just before the high school fields. 1st tee at kiosk next to the river in the upper lot.